It is now only two weeks until Christmas! We are excited, as this is a fun time of year for baking, shopping, wrapping gifts, attending Christmas concerts, and various other winter activities as a family. Quite often, people have photos taken in December to send out with a newsletter to their family and friends in the new year. 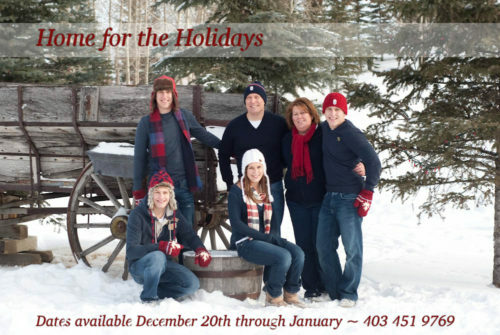 This is a great option for those of you who won’t be with family until Christmas. Are your kids, siblings, grandkids, etc all going to be together at Christmas? It is a great time to have photos taken while everyone is home for the holidays! While the family is together, spend some time capturing those moments to look back on for years to come. Whether it be decorating the tree, indulging in some delicious baking, opening presents, making a snowman, or simply playing games in the living room. We’d love to be there to capture those precious moments for you! Need some tips for family Christmas photos? Check out these pointers to know how to look your best in photos. Looking for a unique and special gift for a loved one this Christmas? 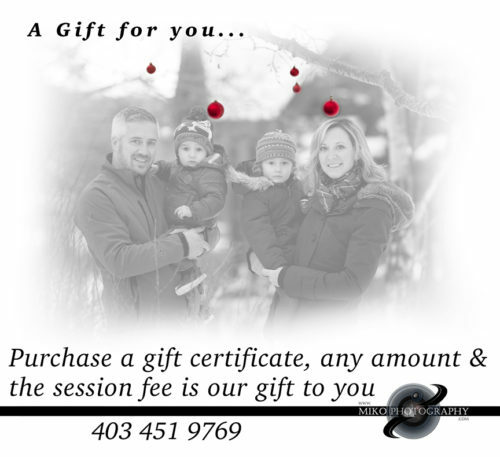 We also have an amazing gift idea for you – Purchase a gift certificate of any amount, and get the session fee as our gift to YOU! Contact Miko Photography today to book your family photos while everyone is home for the holidays! You won’t regret capturing those special memories. Your mom has done many things for you in your life. Celebrate her this May for Mother’s Day with a special gift that she can cherish for years to come. Give mom the gift of JOY this Mother’s Day with a family photo session. Here are three great ideas to make this Mother’s Day gift the best ever…..
Book a photo session of the kids and/or grandkids now to have an online gallery to share with mom on Mother’s Day. Let her choose her favourites as a Mother’s Day gift! This way you know she’ll be getting exactly what she wants because she will have chosen the images while still enjoying the surprise element of the gift by being presented with the online gallery to enjoy. Give Mom a gift certificate and join her for the photo shoot at a later date! Family photos, a mother & daughter photo shoot, grandparents with grandkids or a multi generation photo shoot are all option she could choose from a gift certificate. As with our Christmas promotion, we love to help you be extra generous with your gift certificates so give us a call and we’ll add an extra gift to your gift certificate to help you celebrate Mom this year! If you are a Mom, give yourself a gift this Mother’s day – you deserve it! 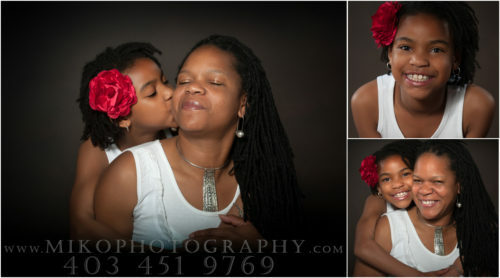 These image are from a session that was just that, a gift this mom gave herself. What a great gift that both mom and daughter will cherish for years to come. However you celebrate, I wish you the happiest of Mother’s Days filled with love, laughter & and photos to commemorate the occasion! Call Jana at Miko Photography, 403 451 9769 or contact us here to give the joy of photography this year.